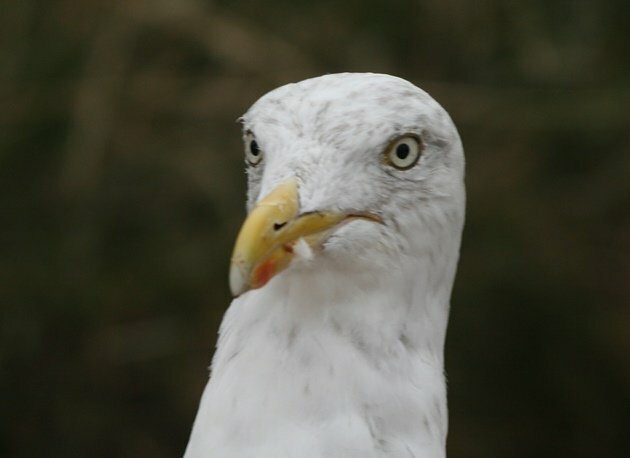 The European Herring Gull is essentially the rump state of what was once an empire of a species ranging throughout the northern hemisphere. Indeed, and here I am showing my age, there once was a time when all the large gulls of Eurasia and North America with a pale grey mantle and a black wing-tip were labelled as “Herring Gulls”, and the gulling was easy. The listing was easy too since the world total of accepted species stood at a little over 8,000, meaning you could become a world birder by just putting up a backyard feeder. Luckily for Noah Stryker and the rest of us, we are now living in days with more diversity, even if this means we have to sit down on a beach and work our way through a flock of gulls like we’re eating our way through sweet porridge. 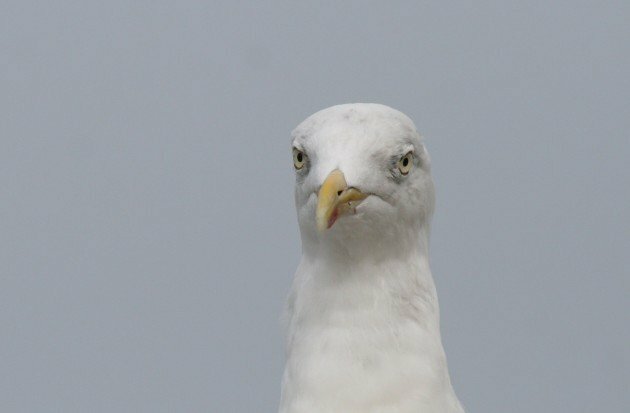 The European Herring Gull, once we are sure that what we are seeing is indeed one, is one of the more interesting of all the large white-headed gulls, or less uninteresting depending on your attitude towards gulls. Thanks to those pesky revisionist-taxonomists who thwarted their imperialistic ambitions, they are now confined to the coasts of northern and north-western Europe, basically inhabiting all coastal regions north of the Spanish-French Atlantic border. In Scandinavia, they are also found inland but not commonly so (if the memory of my birding trips there during the early 1990’s serves me right). This geographic distribution pattern is highly structured, and has subsequently led to a certain degree of differentiation between the western European birds and the Scandinavian birds, which is reflected in them being assigned to two subspecies: Larus argentatus argenteus in the West and L. a. argentatus in Scandinavia. Even for non-gullers, the two forms are not too hard to distinguish, and I sometimes think the only reason they haven’t been elevated to full species level yet is the fact that taxonomists sometimes have a heart and feel pity with fallen global players. However, maybe splitting them off early on in the game could have saved many a birder in Germany a headache or two, or prevented young aspiring gullers from turning away in disgust to easier groups, like pipits or reed warblers. 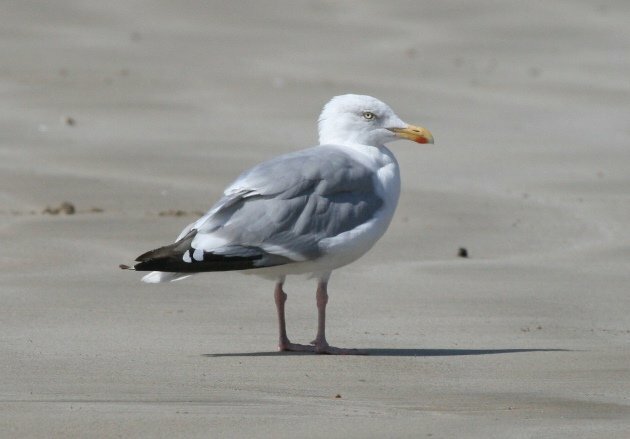 As I mentioned in my earlier post on the Steppe Caspian Gull, early pioneering birders sought to tackle the differentiation of “Herring” and “White-headed” gulls along the Mediterranean coast for the latter and of course their home turf for the former, which was mostly the North Sea coast of the UK and Germany. This is where western Herring Gulls roam, and they were used as the standard reference against which to compare a potential “White-headed”. 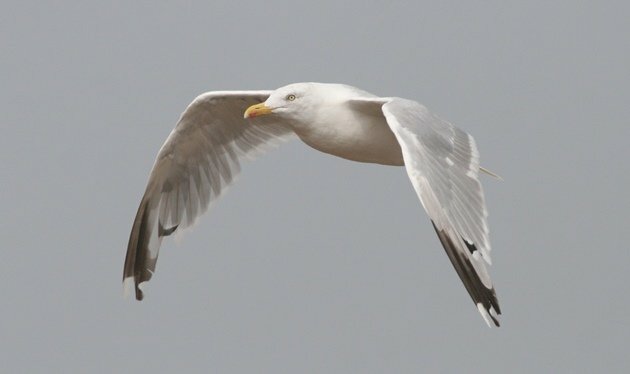 Birders were told by these experts that in comparison to Herring Gulls, “White-headed Gulls” would appear a bit stronger and larger, with a darker mantle and yellow legs. 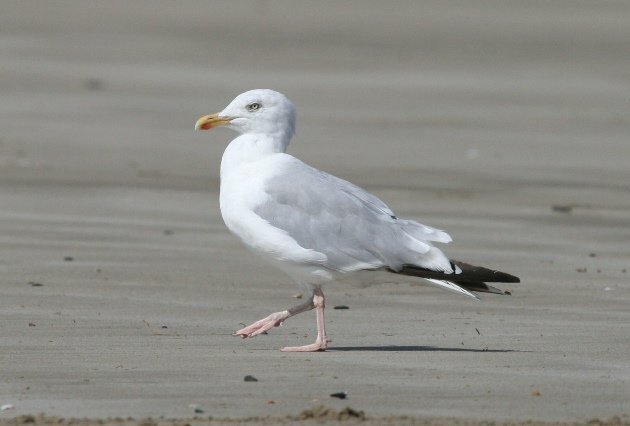 This was bad news for those looking at and for gulls in Scandinavia and along the German Baltic Sea coast where the eastern, nominate subspecies argentatus occurs. Because in comparison to western Herring Gulls, Scandinavian birds appear a bit stronger and larger, with a darker mantle and – sometimes – yellow legs. Yes, I was an aspiring guller on the German Baltic coast in the 1990s and no, thank you, I didn’t like it at all. Actually, the situation was so bad that visiting expert gullers from other parts of Germany – and I mean significant experts – absolutely refused to identify any large white-headed gull at the Baltic coast that wasn’t an adult Great Black-backed. Again, luckily we are living in better times now than in the dark pre-digiscoping and pre-phyllogenetic-species-concept days of the 90’s and have a firm and solid idea of how to identify our gulls. Certainly this doesn’t necessarily mean it has become any less frustrating since then. However, while we may still have to eat our way through a pile of sweet porridge whenever we visit a beach with gulls, nowadays we never forget to bring butter and cinnamon. You don’t have to visit the Cote de Granit Rose in Brittany to see western European Herring Gulls. 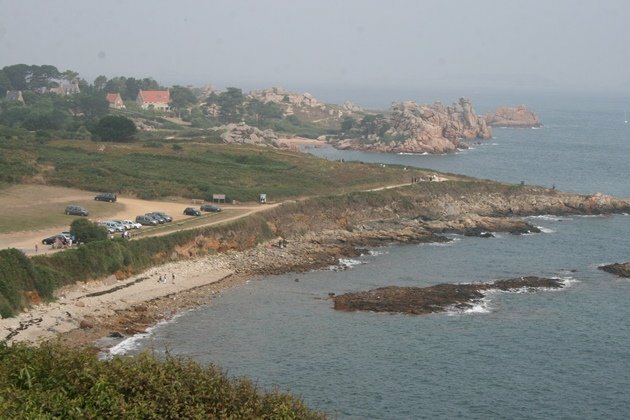 But you’d want to visit the Cote de Granit Rose in Brittany to see western European Herring Gulls. 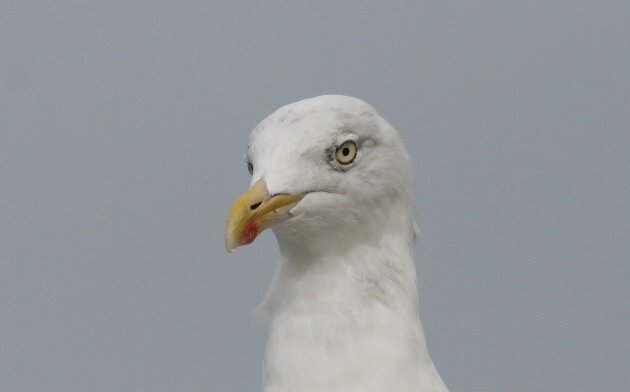 If you were interested in the identification of Euro Herring Gulls, you’d notice the pale eye separating them from (most) Caspian Gulls and the orange orbital ring separating them from Yellow-legged Gulls. If you were not interrested in their identification however, you’d notice that they don’t look quite as attractive as their siter taxa. 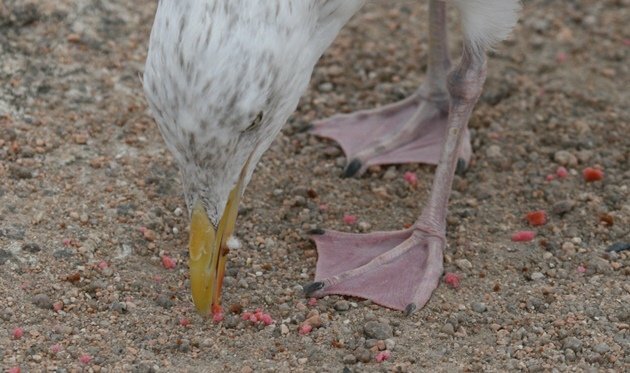 Just like flamingoes, Euro Herring Gulls obtain the pink colouration on their legs through their food, only in this case it isn’t bacteria but French raspberry buscuit instead. Well, let me take a minute to point out that this is no more boring and repetitive than the pictures of Snowy Owls on East Coast beaches that flood the Internet each winter. I don’t necessarily consider myself a guller and have never considered myself insane above the average birder level, but I do find the different shades of grey on a gull’s mantle in lateral light rather attractive. This last post of my little series – as mentioned in the introduction – showcases the European Herring Gull. However, it only shows images of the western subspecies L. a. argenteus. And while this is totally unrelated to anything, I just thought it would be nice for you to know that I have many pictures of Scandinavian birds. You’ve got to be kidding!?! I should have added “…while I will never get tired of albatross pictures”. It’s a sad, sad world we live in, where photos of adorable Snowy Owls are mocked. One can never have enough photos of Snowy Owls.